A grand renovation or 'The Palace of Versailles'? Minimum wage: A Rauner flip-flop-flip? Simple but profound words from the president of my college alma mater almost 90 years ago capture the way I practice journalism. Most of my career has been spent as the Springfield correspondent for the Chicago Sun-Times, where for 19 years I helped unearth some of the shady dealings that sent two Illinois governors to federal prison and derailed the career of a U.S. senator. The Washington Post included me in its list of "the best statehouse reporters in America." My stint in Springfield came during a golden era of reporting there. Barack Obama rose from obscurity in the state Senate to become president, and corruption scandals consumed the governorships of George Ryan and Rod Blagojevich. No story proved bigger than the investigative series that I co-authored that helped trigger the political downfall of former U.S. Sen. Roland Burris. After his 2008 arrest, Blagojevich stunned Illinois' political world by appointing Burris to fill the vacancy left by Obama’s election as president. Blagojevich’s brother solicited Burris for campaign contributions before his controversial appointment. Burris didn’t disclose that important detail during an appearance before an Illinois House impeachment panel, triggering a state perjury investigation and U.S. Senate ethics probe that dashed any hope Burris had of retaining the seat. Tell the truth and don’t be afraid. That’s what I’ve done. In October 2014, I left the Chicago Sun-Times after 19 years. My decision, spelled out on a blog site I created and that you can access by clicking on the image to the right, drew wide coverage. It even resulted in a satirical song being dedicated to me. To this day, I believe the Sun-Times has a soul, and that's embodied by its decades-long history as Chicago's working-class newspaper. I have nothing but admiration for the hard-working reporters, columnists and editors who continue to work there. My departure was something that I didn't take lightly and that I wish I wouldn't have had to make. But as I said in the blog post, "It's about readers and their trust in us." 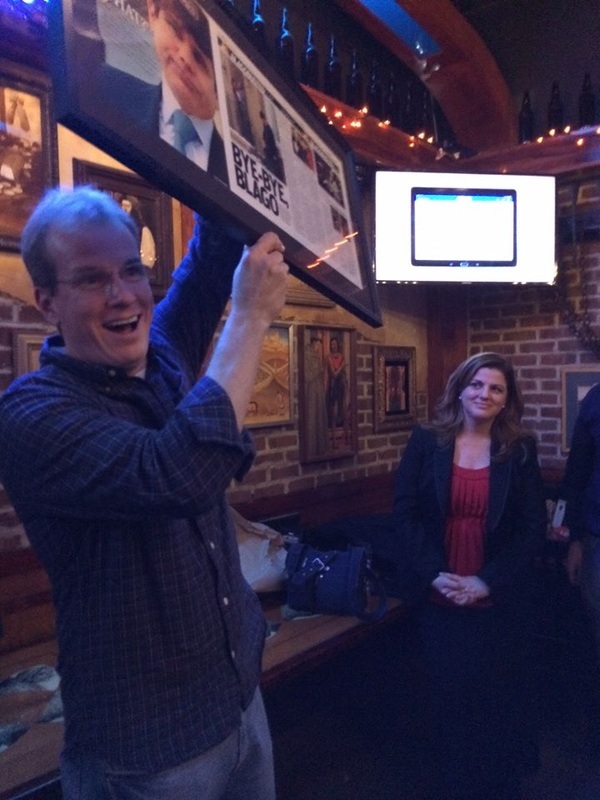 My friend and former colleague, Natasha Korecki, looks on as I hoist a framed front page she, Chris Fusco and fellow Sun-Times staffers gave me as a parting gift. It was from the day Blagojevich was ousted from office and includes the "Sorry for what?" front page. Chicago Headline Club: "Sad day for Chicago Sun-Times and journalism"
Chicago Tribune: Robert Feder: "Sun-Times reporter McKinney cites ‘chilling effect’ in quitting"
Chicago Tribune: Robert Feder: "October surprises: Momentous month for Chicago media"
Illinois Times: Bruce Rushton: "Dave McKinney: Mensch"
Crain's: Greg Hinz: "What really happened with Rauner and the Sun-Times?" Crain's: Greg Hinz: "Turkey trot! This year's award-winning gobblers in politics"
Chicago Reader: Michael Miner: "Is there reason to be alarmed about the Sun-Times?" 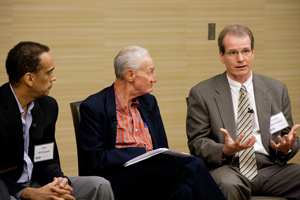 Chicago Reader: Mick Dumke and Ben Joravsky: "2014 in politics: Our fourth annual awards for political achievement"
Chicago Tribune: Eric Zorn: "Sun-Times needs more sunshine on recent troubling story"
Crain's: Lynne Marek: "Did Rauner camp interfere with this Sun-Times reporter's job?" Illinois Times: Rich Miller: "The demotion of Dave McKinney"
The State Journal-Register: Bernard Schoenburg: "A good one"